- First time going outside without his feet covered! Ben's been making some strides himself lately including, finding his hands and possibly even knowing how to use them, smiling at everyone that makes eye contact with him, practicing his gymnastics moves by making his body stiff and pointing his toes, and best of all....sleeping through the night! We'll see how long that lasts, but his Mom is definitely enjoying it! We took lots of pictures. I'll put a few here and link to the full Picasa pictures. SUCH cute pictures - I love the ones of him in his seat with the seersucker, striped hat on...his expressions are priceless! I'm so envious that you were on the beach in March, too. 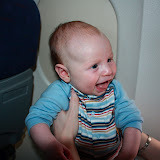 Glad to see you had a great time and that Ben enjoyed his first vacation!